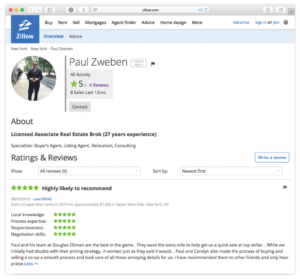 It is humbling to get 6 Zillow reviews, all with 5 stars! We work hard for our customers and it shows! Sold a Cooperative home in 2014 for approximately $1.6M in Upper West Side, New York, NY. Paul and his team at Douglas Elliman are the best in the game. They want the extra mile to help get us a quick sale at top dollar. . While we initially had doubts with their pricing strategy, it worked just as they said it would. . Paul and Carolyn also made the process of buying and selling a co-op a smooth process and took care of all those annoying details for us. I have recommended them to other friends and only hear praise. Sold a Cooperative home in 2014 in Upper West Side, New York, NY. 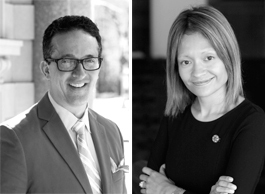 Paul and Carolyn Zweben are a powerhouse and the most amazing real estate agents you could dream of working with. They are the most hard working and honest people you could dream of working with. Their knowledge of the market is unsurpassed and they get the deal done. They have helped us purchase an apartment and sell an apartment and both experiences were a pleasure. You can have confidence when you work with them that nothing is going to fall through the cracks and they will do what has to be done to make things happen. Whether you are looking to buy or sell you have found the right team. If you are a first time home buyer/seller or a veteran you are in the best hands. Sold a Cooperative home in 2014 for approximately $1.55M in Upper West Side, New York, NY. Paul is extremely focused, knowledgeable, and approachable. We were confident being in his hands and he got us great results, while making the process as painless as possible. He’s a true expert in his field who literally does not rest until his clients are happy. Sold a Cooperative home in 2016 in Upper West Side, New York, NY. Paul and Carolyn were fantastic throughout the entire process. I had a terrible broker before who was unable to screen buyers and get a buyer through the coop process. Paul bought me three offers within the first open house and put together a meticulous coop package. The whole transaction was complete in two months. Don’t go anywhere else. 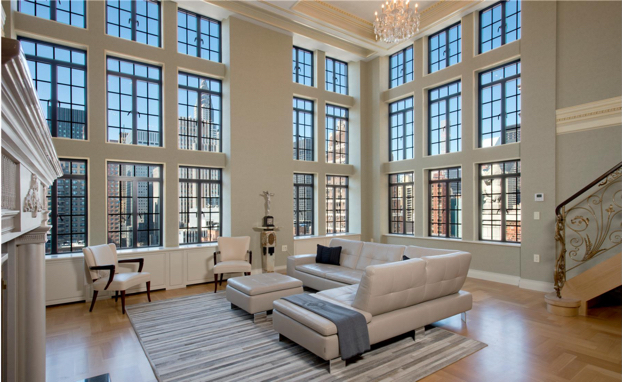 Sold a home in 2014 in Upper West Side, Manhattan, New York, NY 10024. I’ve recommended Paul Zweben and the Zweben Team to everyone I know! They were tireless in their search on our behalf for an apartment on the inventory-poor UWS. They made spot-on recommendations about appropriate bids and negotiated brilliantly on our behalf, helping us secure our dream apartment. And in selling our apartment, they showed us how to market it appropriately and stage it to best showcase its assets. They also did a terrific job of managing our expectations about what offers we could expect and, in the end, managed to get us way over our asking price. In my dealings with Paul and the Zweben Team, I found them to be unfailingly honest and fair, which is rare in this business. I cannot recommend them more highly.